Computer viruses have become a constant companion to personal computers. Protecting against viruses is getting more challenging year after year as the Internet grows and communications software becomes more tightly integrated with normal business activities. 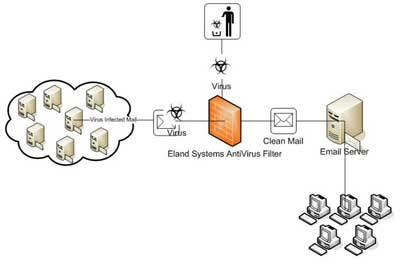 The Eland Appliance Antivirus service scans all email messages and all attachments, including archives, exe files, embedded files, etc as they enter the network. This prevents the viruses, worms, and trojans from infecting the desktop computers on your internal network. The Eland Appliance Antivirus service supports F-Prot and ClamAV Antivirus scanners. It can be integrated with one of these scanners or both to shield your users from e-mail borne malware such as viruses, worms and trojans. The Antivirus service automatically updates its signature files to to bring you the latest protection available. In the age of the Internet and other networks, it's easy for a virus to spread like wildfire. However, if we all practice safe computing, we can make sure our systems stay healthy. If you receive an unexpected attachment from someone, even someone you know, do not open it. Check with sender and see if it is legitimate. If you cannot verify its legitimacy, delete it.